The best organizations have the best talent. . . Financial incentives drive company performance. . . Firms must change or die. Popular axioms like these drive business decisions every day. Yet too much common management wisdom” isn’t wise at all-but, instead, flawed knowledge based on best practices” that are actually poor, incomplete, or outright obsolete. Worse, legions of managers use this dubious knowledge to make decisions that are hazardous to organizational health. Jeffrey Pfeffer and Robert I. Sutton show how companies can bolster performance and trump the competition through evidence-based management, an approach to decision-making and action that is driven by hard facts rather than half-truths or hype. 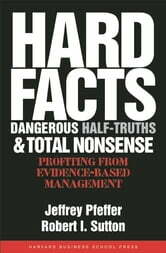 This book guides managers in using this approach to dismantle six widely held-but ultimately flawed-management beliefs in core areas including leadership, strategy, change, talent, financial incentives, and work-life balance. The authors show managers how to find and apply the best practices for their companies, rather than blindly copy what seems to have worked elsewhere. This practical and candid book challenges leaders to commit to evidence-based management as a way of organizational life-and shows how to finally turn this common sense into common practice.